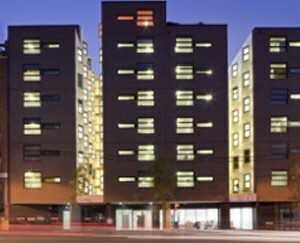 Located in Chippendale’s student district, 15-25 Regent Street is a purpose-built student residence and academic center, which is comprised of 6,410 square meters. The nine-story building accommodates housing, office/administrative, and classroom functions for Boston University. The design of the building specifically incorporates two separate entrances/lobbies for the residential and office components. The student residence incorporates a total of 44 multi-share flats serving 164 students as well as a two-bedroom manager’s flat. The academic and office space contains a total of 1,611 square meters and includes an impressive 160-person stadium-seating auditorium. Student amenities include a rooftop terrace with a function space, a commercial kitchen, student lounges, computer rooms and laundry facilities.